SAN JOSE – Forward Claude Lemieux today formally announced his retirement from the game of hockey at the age of 44. One of the most successful NHL players in the history of the League, Lemieux won four Stanley Cups and is one of only eight players to win hockey’s greatest prize with three different teams (Montreal, 1986; New Jersey, 1995 and 2000; Colorado, 1996). In 1,215 National Hockey League games with Montreal, New Jersey, Colorado, Phoenix, Dallas and San Jose, Lemieux posted 786 points (379 goals, 407 assists) and 1,777 penalty minutes, along with 58 game-winning goals. However, it was the Stanley Cup Playoffs where Lemieux defined his legacy, becoming one of the most potent post-season performers in NHL history. His 234 playoff games are fifth all-time behind only Chris Chelios, Patrick Roy, Nicklas Lidstrom and Mark Messier. Lemieux’s 80 playoff goals are more than Jean Beliveau (79) and only two fewer than Maurice “The Rocket” Richard and his 19 post-season game-winning goals are tied-for-third all-time, trailing only Wayne Gretzky and Brett Hull (24). In addition, he sits 24th in Stanley Cup Playoff points (158) and tied-for-37th in playoff assists (78). He also won the Conn Smythe Trophy as the Stanley Cup Playoffs Most Valuable Player in 1995 with New Jersey. Drafted in the second round (26th overall) of the 1983 NHL Entry Draft by the Montreal Canadiens, Lemieux made an early impact for his hometown franchise. Despite playing in a total of only 19 regular season games with Montreal over his first three professional seasons (1983-1986), Lemieux cemented his reputation as an NHL player in the 1986 Stanley Cup Playoffs, appearing in 20 Stanley Cup Playoff games, posting 16 points (ten goals, six assists) and 68 penalty minutes en route to helping the Canadiens win the Stanley Cup. Lemieux would hit the 20-goal mark nine times, including posting a career-high 41 goals in 1991-92 with New Jersey and 39 in 1995-96 with Colorado. He posted a career-high 81 points in 1992-93 with New Jersey (30 goals, 51 assists). In addition, he topped the 100 penalty minute plateau ten times. 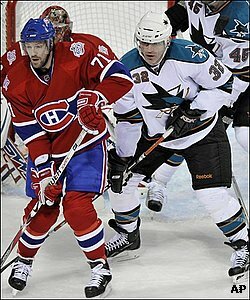 In 2008, Lemieux made a remarkable comeback to the National Hockey League with the Presidents’ Trophy-winning San Jose Sharks. After being out of the game for five years, Lemieux decided he wanted to continue playing the game he loved. Sharks Executive Vice President and General Manager Doug Wilson afforded Lemieux the opportunity to play for the Sharks Asian League affiliate, the China Sharks and he later signed an AHL contract with the Worcester Sharks of the American Hockey League. Lemieux played in his 1,200th career game on Jan. 29 vs. Phoenix and registered his first National Hockey League point (an assist vs. Los Angeles on Feb. 20) since March 9, 2003 with Dallas. He finished with one assist and 21 penalty minutes in 18 games with San Jose. Lemieux was inducted into the Quebec Major Junior Hockey League Hall of Fame in 2005 and became a naturalized U.S. citizen on June 26, 2009.